Whether works in an exhibit are juxtaposed or in perfect sync with the space, architecture guides my curatorial process for placement, color, formality, and ideas. As the world's most interdisciplinary creators, leading-edge architects have inspired me to create with scientists, scholars, and with the architects themselves. Like Warhol in his Factory, I see what the makers around me are doing and create fully with their influence. When I say this people sometimes think that I'm speaking about Pop Art but what I'm talking about is the concept of the Factory itself. Scientists we work with can be likened to Lou Reed playing with Nico and we like Warhol, producing their debut. The exhibitions I curate on themes of nature science and endangered natural systems offer new perspectives and educate. These exhibits help audience members to pay attention without blinders and with open minds. What resonates from advanced visual communication is feeling. And feeling moves us towards hope, and hope to action. ​Although professional artists are most often a joy to work with, new perspectives can come from unlikely sources. Our exhibitions are not only built with artists we've come to represent but through research and call outs that elicit the unexpected. Editing the serendipitous work that comes through is the point where curating gets exciting. 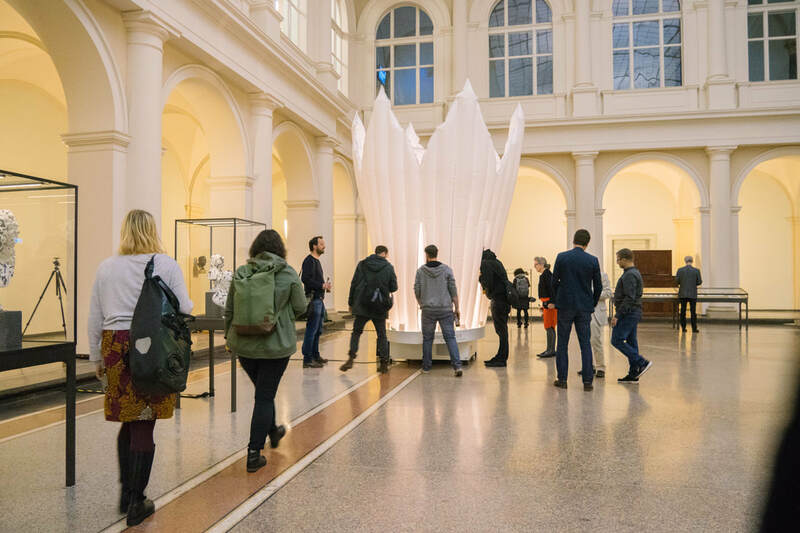 Although we love small projects, placing art in large spaces--like Thaer-Insitut's grand hall in the heart of Berlin, next door to the Museum für Naturkunde Berlin, and Humboldt-Universität zu Berlin's Science Branch Library in the epicenter of one of Europes largest science parks--gives surprising results. A few well placed works of art can change the feeling of a huge space, align with the architecture, and make an impact.